OS Grid Reference: SD 9617 1680. 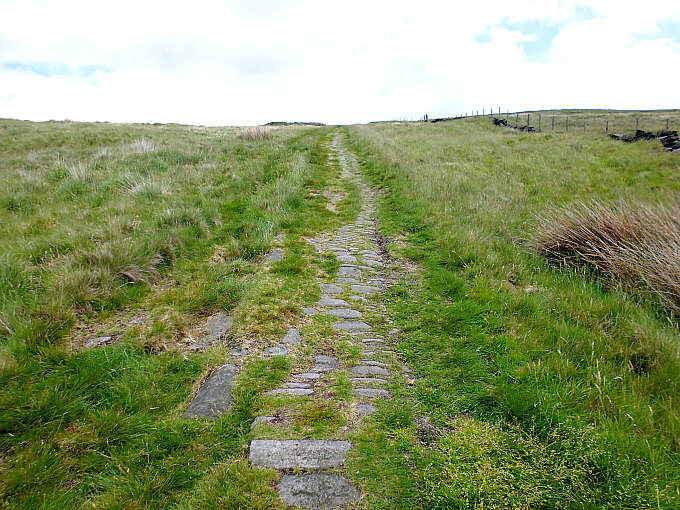 Blackstone Edge Roman Road is located 2 miles east of the town of Littleborough – running almost parallel to the A58 Littleborough to Halifax road. Blackstone Edge ‘Roman Road’ is a cobbled ‘road’ surface traversing the bleak moorland for about 2 miles or so along Blackstone Edge on the Lancashire-West Yorkshire border. The road has a deep groove running down the centre. It is a Scheduled monument initially thought to be of Roman Origin. This road is still marked on Ordnance Survey maps as a ‘Roman Road’ but nowadays the most widely accepted theory is that it is an early turnpike road from circa 1735. Until recently popular opinion had it that before the Romans there were no roads in the British Isles. This is not a correct interpretation of the situation. Ancient routes such as the Ickneld Way existed long before AD43. The Romans did build roads and this was one of the reasons for their great success. Roads aided administration as the Empire became ever larger. Roads aided the quick movement of troops to deal with insurgencies and incursions, and they helped to facilitate trade. However the evidence shows that similar structures usually of timber existed from Neolithic Times. More sophisticated structures existed in the Bronze Age using stone and Timber. The Iron Age saw the introduction of gravelled streets as at Danbury and Silchester. 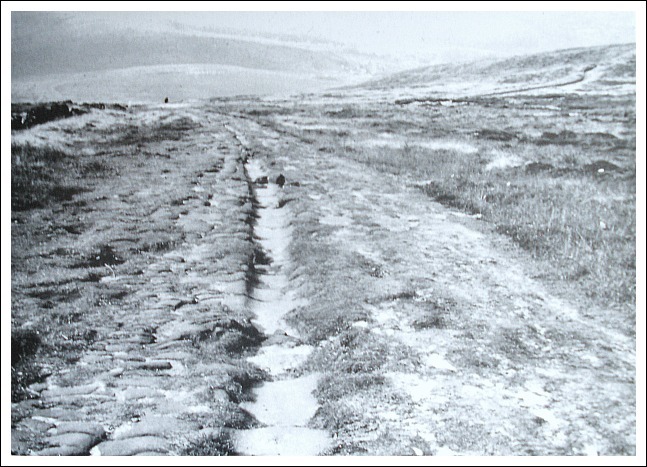 Roman Roads typically consist of a consolidated embanked and cambered core of earth, chalk or stones (the agger), which was then surfaced with compacted stone or gravel. The wider zone was then often defined by boundary ditches, and sometimes further drainage ditches, or trenches from which material for the agger was dug. Blackstone Edge ‘Roman Road’ (at almost 6 metres in width) does not conform strictly to this approach and the other problem with Blackstone Edge ‘Roman Road’ is that the groove running down the centre is unusual, and has therefore led to other theories about its origin, though similar grooved drainage ditches are known from Roman sites around the country. It has been suggested that this channel may once have accommodated a cable that was used to winch vehicles up the incline. In keeping with this theory a circular foundation block can still be seen at the top of the incline this solution to the problem being hinted at in the Turnpike Act of 1734. On the other hand, some experts believe that the central channel was used to help vehicles brake as they descended the steep incline down towards Littleborough and others propose that it was merely a drainage duct. Blackstone Edge Roman Road, today. Excavations first took place in 1923/24 under Ian Richmond. In 1965 James L Maxim ‘A Lancashire Lion’ proposed that it was a turnpike road dating from 1735 – immediately following the Turnpike Act of 1734. Possibly built on or next to an earlier, probably Medieval Packhorse Route. Maxim proposed that the central groove was for cables assisting cables to negotiate the steep incline with the circular “foundation” acting as a pulley. However, a further survey in 2012, which involved fieldwork and reviewing the evidence, questioned some of these assumptions. Why was work undertaken to create deep and wide cuttings, and what appears to be a terrace on one side? Further the packhorse way closely follows the road using one of the cuttings. The survey came to the conclusion that it might have to be reconsidered as a Roman Road. Another possibility is that none of these apply and it is, in fact, a more modern, perhaps 19th century moorland track that has long been associated with the quarrying of stone. The Roman road that runs over Blackstone Edge linked the large Roman legionary fortress of MAMVCIVM (Manchester) to the smaller fort of VERBEIA (Ilkley) and is some 36 miles long. Some historians have, perhaps, wrongly called the fort at Ilkley (OLICANA). About a mile up the moorland path from the A58 (where the Roman road officially begins) stands Aiggin Stone, a boundary-stone that is inscribed with some Latin letters and a cross; its name is perhaps a derivation of “agger” the material from which the Roman road was constructed. Categories: Roman road on Blackstone Edge at Lancashire/Yorkshire border, Roman Sites | Tags: Blackstone Edge Roman Road on Lancs-Yorks Border | Permalink.